Dimensions (W x D x H): Overall Dimension: 7-9/16� X 3-1/8� X 8-7/8"
MRD80 is one of the MRD80 series. MRD80 is the Disc Player version. MRD80 is an AM/FM/CD/MP3/WMA/Sirius Satellite Ready stereo. MRD80 is a full-featured waterproof marine stereo, waterproof designed, engineered and optimized for marine use. 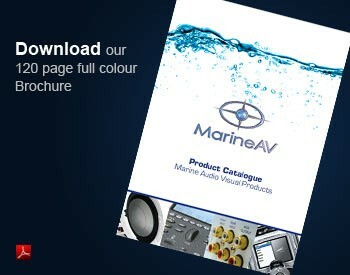 Designed specifically for the marine environment. With adjustable backlight display type with flip down face design. SD Card Reader available at the front. AUX-Input available, iPod� Input available and USB Input available to play your music from a USB Flash drive. Wired and Wireless Remotes available (sold separately). Gimbal mount option that allows the unit to mount anywhere from top to bottom. Overall Dimension: 7-9/16� X 3-1/8� X 8-7/8"